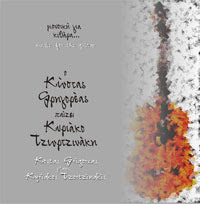 A collection of solo guitar works by HEITOR VILLA-LOBOS, MANUEL PONCE, ABEL CARLEVARO, MICHALIS TRAVLOS, NIKOS SKALKOTTAS, LENA PLATONOS, KYRIAKOS TZORTZINAKIS and KOSTAS GRIGOREAS. 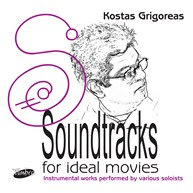 ‘…Great, Kostas! I enjoyed every single note of your playing. WORDWIDE DISTRIBUTION BY CdBaby & all major online stores . 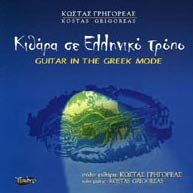 Kostas Grigoréas (Gree-go-ré-as), an eminent member of the Greek guitar fraternity, holds a special place in the field of Greek music as a classical guitar soloist with a brilliant career spanning over thirty years, as well as a collaborator of important Greek composers and singers in concerts and recordings. 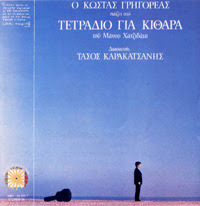 A composer ‘of rich vision’ (according to top music critic George Leotsakos), he has contributed a substantial oeuvre to the repertoire of Greek instrumental music. As a teacher, following the great tradition of Greek guitar virtuosi, he has created a school of distinguished musicians.